In 1500 AD, some of the people who lived in what is now Angola were Bantu and some were San. A Bantu man from Congo, Kiluanje, probably started the kingdom of Ndongo there. Ndongo was sometimes pretty much independent, but at other times the rulers of Kongo also ruled Ndongo. Ndongo’s capital city was Kabasa, and like Mbanza Kongo it was a pretty big town. Maybe 50,000 people lived there. Some Angolan people were free, some were serfs who had to farm the land, and some were enslaved. In north Angola, farmers grew millet, sorghum, yams, and groundnuts. Where does sorghum come from? Further south, where it doesn’t rain enough to farm, people herded cattle as in Botswana. Fishermen also caught fish in small boats in the Atlantic Ocean. Blacksmiths made tools of copper and iron. Portuguese traders brought new crops from Brazil to Angola (and their other African colonies) in the 1500s – corn, potatoes, yuca root, sweet potatoes, and peanuts. Who were these Portuguese guys? 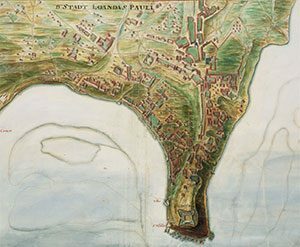 In 1576, these traders started a city at Luanda where traders and Portuguese settlers lived. The traders sold rum (a kind of alcohol) and guns to Angolans and bought ivory and enslaved people, taking them on ships to work on sugar plantations in Brazil. Kiluange, the king of the kingdom of Ndongo, built alliances with his African neighbors and resisted the Portuguese, but the Portuguese caught him and killed him. Some years later, Jinga Mbandi rebuilt those alliances. 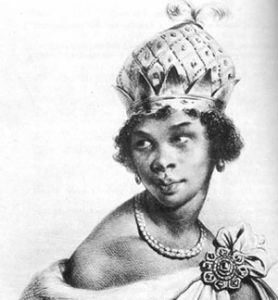 In 1641, she also made an alliance with the Dutch who took over Luanda, and stopped the slave trade to Brazil. But the Portuguese settlers in Brazil really wanted those slaves. In 1661, the Brazilians sent an army over and defeated Jinga Mbandi. She died two years later. A few years after that, the King of Congo tried again to force the Brazilians to leave Luanda, but he lost too, and by 1671 Brazil forced the Kingdom of Ndongo (and also Congo) to give up their independence. In the 1700s, the Brazilians forced Angolans to produce a lot of stuff for them to sell. Brazilians brought over rubber, cotton, and chocolate from South America and made the Angolans grow them – but the Brazilians and Portuguese kept the profit and got rich, while Angolans only got poorer. The Brazilians didn’t build schools or hospitals or roads in Angola. They didn’t do the things a good government should do. That’s pretty much the story of the 1800s too. By the 1900s, the Brazilians gave up on enslaving people, but they kept right on forcing Angolans to work for them. They were still not a responsible government. In the 1950s, Angolans started to fight for better treatment. By 1975, with Cuba‘s help, the Angolans won their battle for independence. But from then until 2002 there was a terrible civil war in Angola that pretty much wrecked most of the farms in Angola. Cite this page: Carr, K.E. History of Angola – African History. Quatr.us Study Guides, May 24, 2017. Web. April 24, 2019.